Bill Johnson advocates “encounters” over good theology. 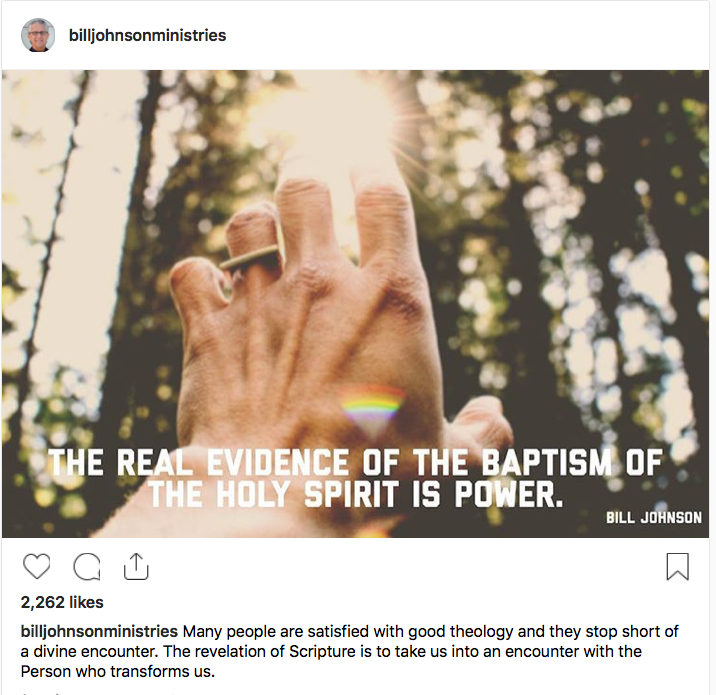 Home › Bethel "Church" › Bill Johnson advocates “encounters” over good theology. The Apostle Paul warned the elders of the church at Ephesus that ‘fierce wolves’ would rise up soon after his departure. “I know that after my departure fierce wolves will come in among you, not sparing the flock; and from among your own selves will arise men speaking twisted things, to draw away the disciples after them.” Acts 20:29-30. Two thousand years later, this strong biblical warning is just as urgent. If you are confused as to why Bill Johnson’s Instagram post above is so wrong, we encourage you to read the following articles. Charismatics/NARismatics and their ‘alien baptism’. What is the Power Hungry Heresy? Bill Johnson is promoting a demonic baptism that has nothing to do with Christianity. The real evidence of the baptism of the Holy Spirit is our joining with Christ in His death, burial, and resurrection evident by our separation from the power of indwelling sin and our walk in newness of life. This is not what Bill Johnson seeks – he is a very dangerous false teacher leading many to eternal destruction. And as many are beginning to realise, Bill Johnson needs to be seriously tested against God’s Word, then marked and avoided. ‹ Healing from theological abuse.